This study evaluated the impact of Coral Reef Rehabilitation and Management Program II (COREMAP II) on people’s welfare. It found that the program has helped increase the income of fishing families. The program has also helped diversify fishers’ income sources, has helped them to understand the importance of marine conservation, and has encouraged them to participate in local conservation action. COREMAP II has also significantly improved marine biodiversity. 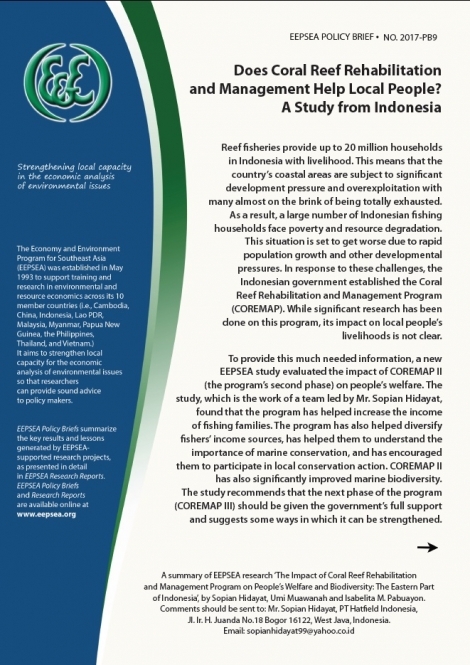 The study recommends that the next phase of the program (COREMAP III) should be given the government’s full support and suggests some ways in which it can be strengthened.